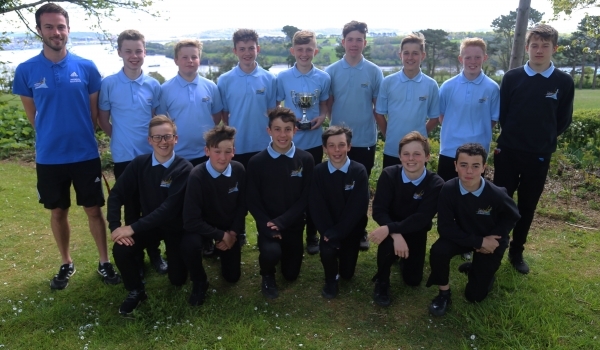 Saltash.net’s U13 Boys’ football team were crowned County Champions on Thursday 20 April, having secured a 2-1 win over Mounts Bay Academy (West Cornwall champions) in a very exciting final. Goals came from Jenson Bryan and Leighton Poolman, who scored the winner in the 3rd minute of stoppage time to send the saltash.net-supporting crowd wild. The final is the 5th game in this competition, which started in January, so it really is a huge achievement. Both schools were praised by the FA for their, “Reputation county wide as strong footballing schools,” as well as their conduct, attitude and style of play. The great support and following from saltash.net parents who had made the journey to St. Blazey for the final and who have supported the team fantastically for the past two years, was acknowledged, which was testament to the support they give to the boys and the school. The championship win follows the same team’s agonising defeat in the County Final last year. Team coach Mr. Budd was very proud of the students. “Reaching finals in successive years is an incredible achievement for these boys, and represents a fantastic effort. The boys are ecstatic after last year’s final defeat, and huge congratulations go to them,” he said.